If your organization is interested in having John speak at your event, please call: 703-250-4869 or email: john@johngradynowandthen.com. Depending on circumstances, speaking fees will vary. We will be happy to discuss an appearance. 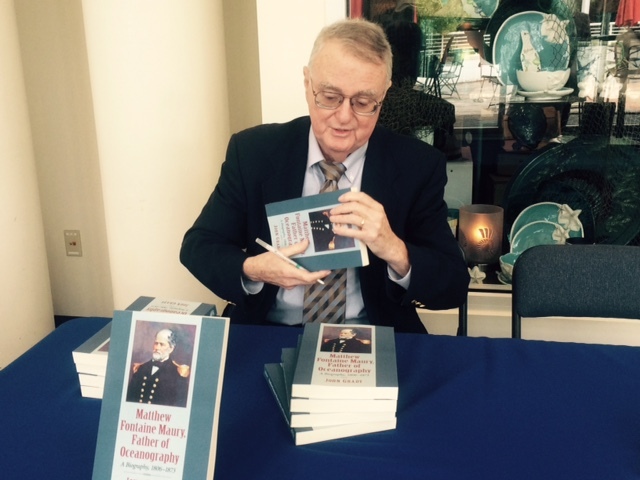 A Biography, 1806 – 1873,” discusses Maury’s time in Richmond during the American Civil War and his contributions to the Confederacy in this lecture. Margaret Stack, University of Connecticut, November 2016, vol. 82, no. 4, 1002. The substantial bibliography included in Grady’s book does not only easily demonstrate that the book is based on solid research and knowledge of the wider historical framework, but is also a most helpful tool for anybody interested in naval history and/or history of oceanography during the 19th century. You might have wished for some more illustrations, in particular of the various charts produced by Maury over his whole career, reproductions of his scientific works, etc. Given the fact that the book is available for a reasonable price, this does not limit the positive impression of the book at all. Without any doubt, Grady needs to be credited for bringing one of the most interesting naval officers of the 19th century back to center-stage and for writing a book that is simply an enjoyable read. You can read full review, starting on page 86 here.